Home » boy scouts of america , celebration » The Boy Scouts of America is 100 years old today! The Boy Scouts of America is 100 years old today! On February 8th, 1910, the Boy Scouts of America was founded by William D. Boyce, Edward S. Stewart and Stanley D. Willis. 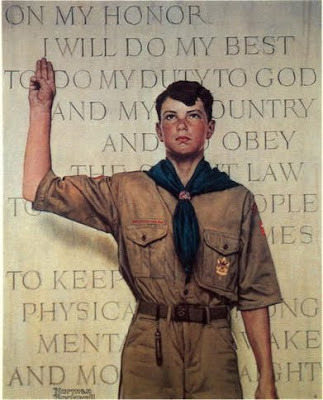 It had been Boyce who first discovered the Boy Scouts in Great Britain during a trip there in 1909, and thought that it would be a good thing for the youth of the United States as well. A hundred years later, more than 110 million Americans have taken part in the Boy Scouts of America in some form or another. More than two million of them have earned the rank of Eagle Scout (and it's been one of the greatest and most humbling honors of my life to be among them). So Happy One-Hundredth Birthday to the Boy Scouts of America! It's come a long way... but I've a feeling that Scouting's best days are yet to come.